Compact equipment for cooling and dispenzing of tank beer. The dry coolers works without water loops. 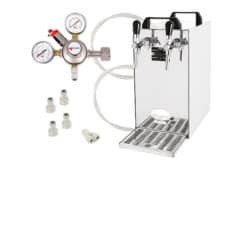 The DBCS-BPE25-2 Black Pearl Exclusive cooler with an inbuilt air compressor is designed for professional cooling and dispensing of excellent chilled two kinds of beer for domestic use and smaller garden parties. Coolers from the EXCLUSIVE series are the showcase of unprecedented elegance. The handle suitable for the transportation is retractable, all control elements are hidden at the back of the cooler, the sides are mooth without any ventilation grids and a new handle fi ts perfectly into the modern concept. 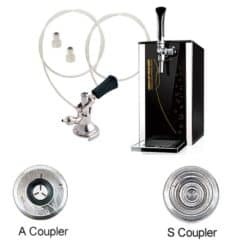 This set is without couplers for connecting to kegs. 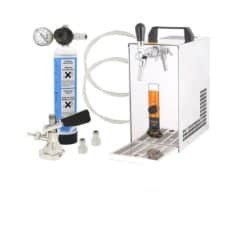 The DBCS-BPE25 Black Pearl Exclusive cooler with an inbuilt air compressor is designed for professional cooling and dispensing of excellent chilled beer for domestic use and smaller garden parties. Coolers from the EXCLUSIVE series are the showcase of unprecedented elegance. 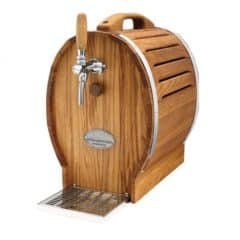 The handle suitable for the transportation is retractable, all control elements are hidden at the back of the cooler, the sides are mooth without any ventilation grids and a new handle fi ts perfectly into the modern concept. 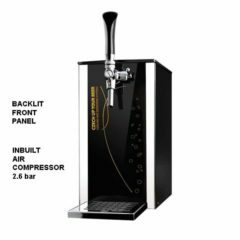 The luxurious BARELL-B31 beer cooler is designed for professional cooling and dispensing of excellent chilled beer in professional, commercial and home use. This cooler has a continuous cooling performance of 25-30l/h, max.35l/h. 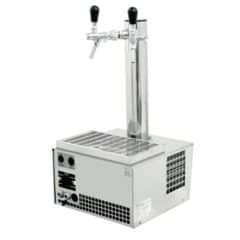 The luxury beer cooler DBCS-ST25C Slim Tower 1/8 HP Draft Beer Cooler without compressor is aesthetically designed for front bar operation, e.g. 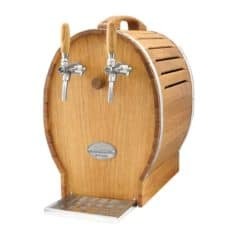 small restaurant, garden party, bistro, etc., this cooler compliments any bar configuration. 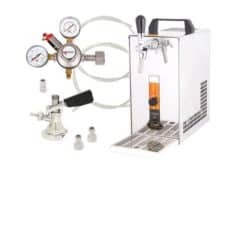 This set is delivered with a valve for connection to CO2-bottles (Carbodioxide).. This cooler has a continuous cooling performance of 20-25 l/h., max. 30l/h. The luxury beer cooler DBCS-ST25N Slim Tower 1/8 HP Draft Beer Cooler without compressor is aesthetically designed for front bar operation, e.g. 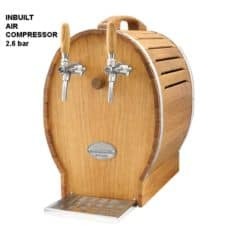 small restaurant, garden party, bistro, etc., this cooler compliments any bar configuration. This set is delivered with a valve for connection to N2-bottles (Nitrogen). 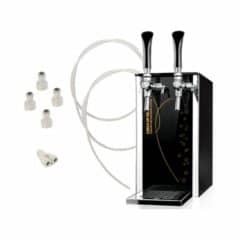 The luxurious DBCS-B52 Barell Small 1/5 HP Draft Beer Cooler is designed for professional cooling and dispensing of excellent chilled beer in professional, commercial and home use. This cooler has a continuous cooling performance of 35-40l/h, max. 50l/h. An air compressor is not included. 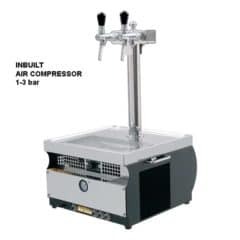 The luxury The luxury beer cooler DBCS-ST25AC Slim Tower 1/8 HP Draft Beer Cooler with air compressor is aesthetically designed for front bar operation, e.g. 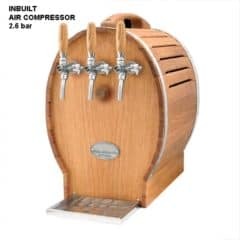 small restaurant, garden party, bistro, etc., this cooler compliments any bar configuration. 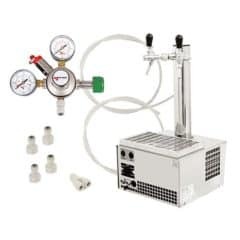 This set is delivered without a valve for connection to CO2 or N2 bottles. 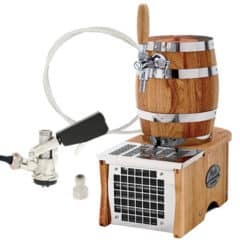 The luxurious DBCS-B52AC Barell Small 1/5 HP Draft Beer Cooler is designed for professional cooling and dispensing of excellent chilled beer in professional, commercial and home use. This cooler has a continuous cooling performance of 35-40l/h, max. 50l/h. Inbuilt an air compressor. 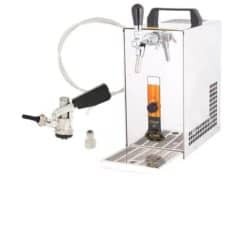 The luxurious DBCS-BP52AC Barell Profi 1/5 HP Draft Beer Cooler is designed for professional cooling and dispensing of excellent chilled beer in professional, commercial and home use. This cooler has a continuous cooling performance of 35-40 l/h, max. 50 l/h. Inbuilt an adjustable air compressor. 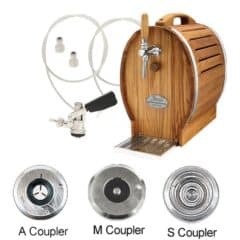 The luxurious DBCS-B53AC Barell Small 1/5 HP Draft Beverage Cooler is designed for professional cooling and dispensing of chilled wine and beverage in professional and commercial use. 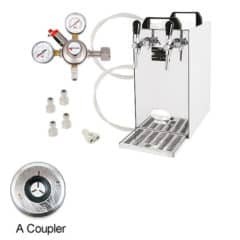 One tap is designed for the UNCOOLED beverage, for example red wine. Only two taps are cooled !! This cooler has a continuous cooling performance of 35-40 l/h, max. 50 l/h. 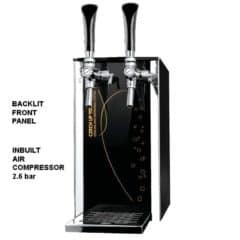 The DBCS-PT50 Profi Tower 1/5 HP Draft Beer Cooler is a professional cooling system which stands out from our range of dry contact cooling systems for its versatile use in the commercial use, breweries or larger receptions. This cooler has a continuous cooling capacity of 35-40l/h., max. 50l/h. This set does not include an air compressor. 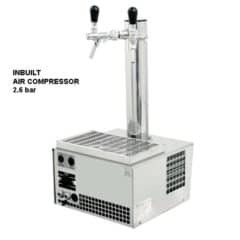 The DBCS-PT50AC Profi Tower 1/5 HP Draft Beer Cooler is a professional cooling system which stands out from our range of dry contact cooling systems for its versatile use in the commercial use, breweries or larger receptions. This cooler has a continuous cooling capacity of 35-40l/h., max. 50l/h. 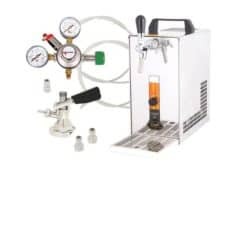 This set includes an inbuilt air compressor.